Walk it on your own – or for more Savannah and Gordon/Low lore, hire our trained Safari guides!Our guides bring light-hearted stories about Savannah and add zing and zip to your Safari adventure. Each book is $6. Bring along a pencil. 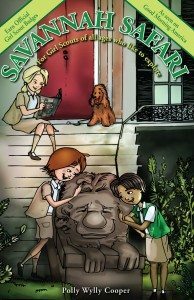 Badges are available at the Girl Scout First Headquarters, 330 Drayton Street (behind the Andrew Low House) just steps from the start and end of your Safari.